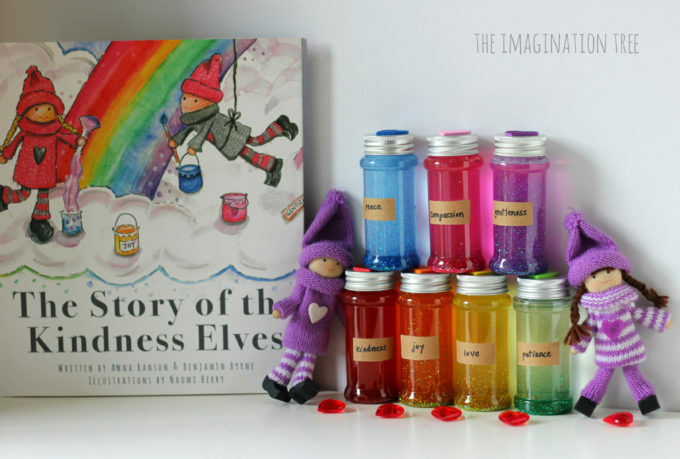 Make some rainbow coloured Kindness Potions Sensory Bottles to learn about what makes a kind and caring heart, after reading The Story of the Kindness Elves book! This is such a fun way to learn a little science, PHSE, literacy and a sprinkling of awe and wonder. 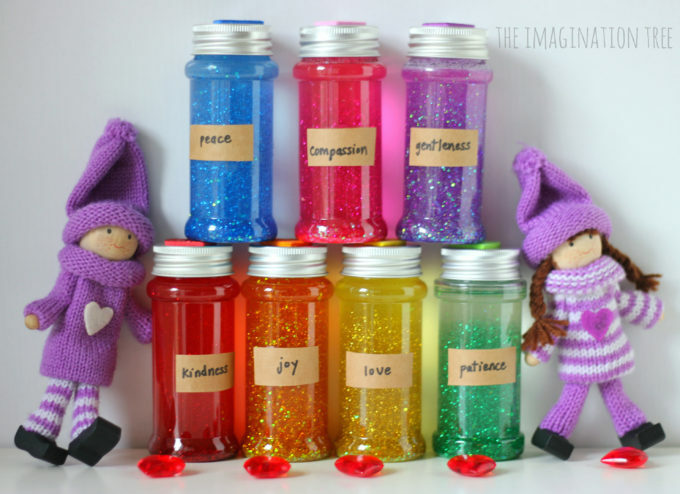 The kindness potions sensory bottles make a wonderful tool for reflective mindfulness too and are a great addition to a class or home calm-down kit. 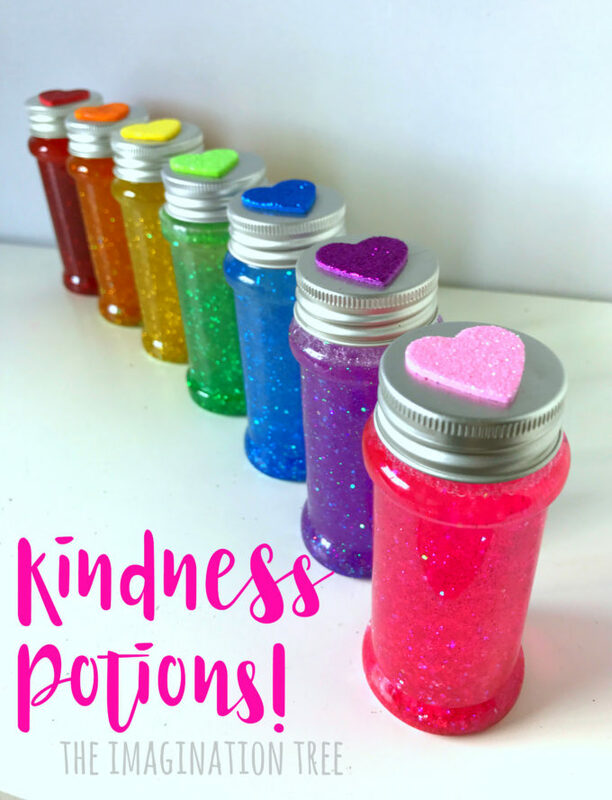 This Kindness Potions Sensory Bottle activity is both a science demonstration and also a lovely tool for talking about feelings, kind character virtues and mindfulness. The fact that they’re rainbow coloured and look rather gorgeous is a bonus too. I found them quite irresistible to play with myself, let alone the kids! Next, fill nearly to the top with the warm water. We used water from a recently boiled kettle as the heat seems to help the glitter glue mix more quickly. 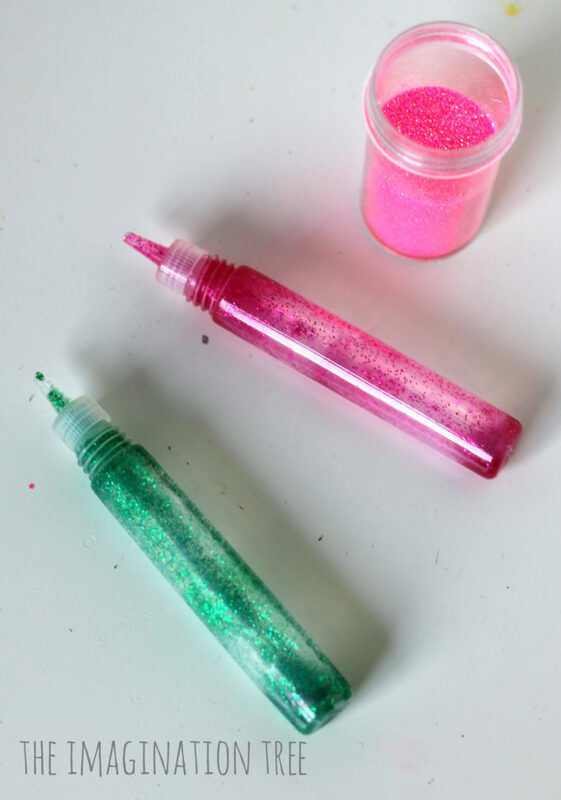 Then tip in a heap of glitter in matching colour, seal the lid tight (using a hot glue gun if necessary) and give a big shake to mix it all together! You can watch our how-to video here to see how we made all 7 colours. 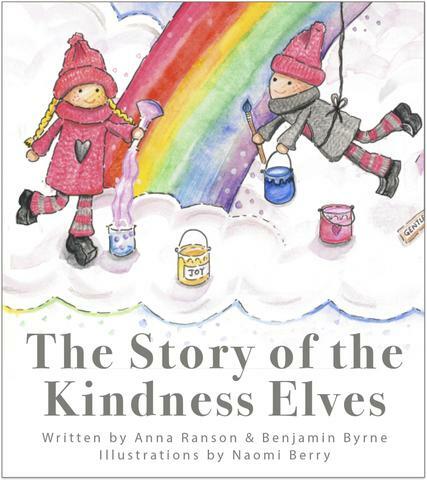 After that we read our copy of The Story of the Kindness Elves again and looked especially at the page about the kindness elves using their very special potions to paint colours onto the rainbow. You can see them painting the rainbow here on the front cover and each special pot contains a different character virtue that forms the building blocks of a kind and caring heart. 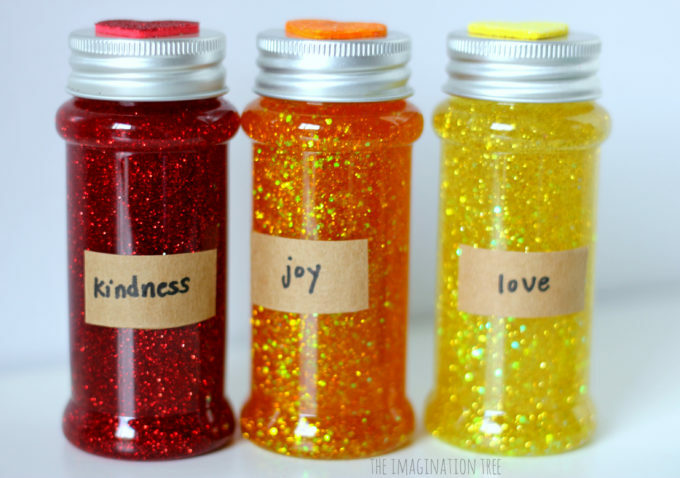 We made a tiny label for each of these lovely virtues and stuck it on to the corresponding bottle. 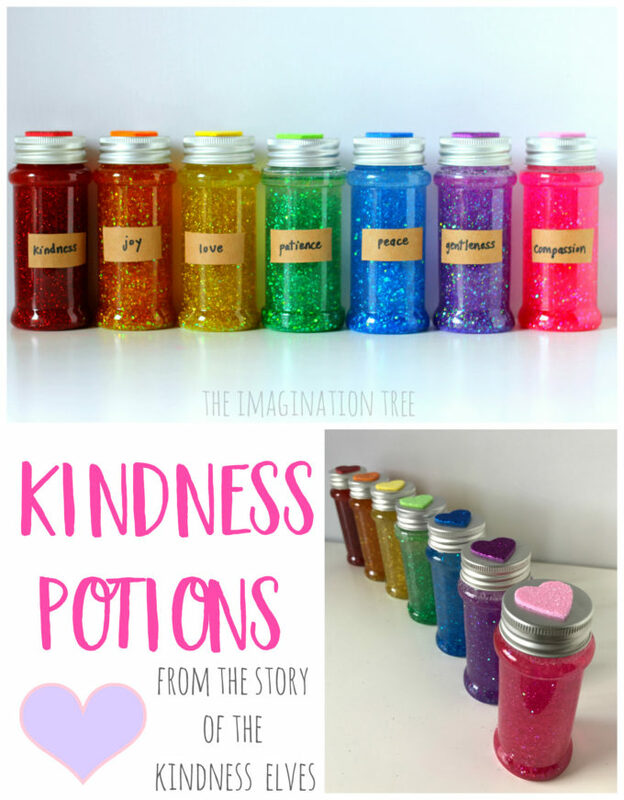 Now we have Kindness Potions just like from the book! 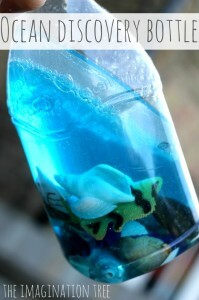 The kids have really loved these tiny sensory bottles. Firstly, they’re just so fun to keep turning over and shaking up to see that beautiful glitter fall and swirl so slowly. 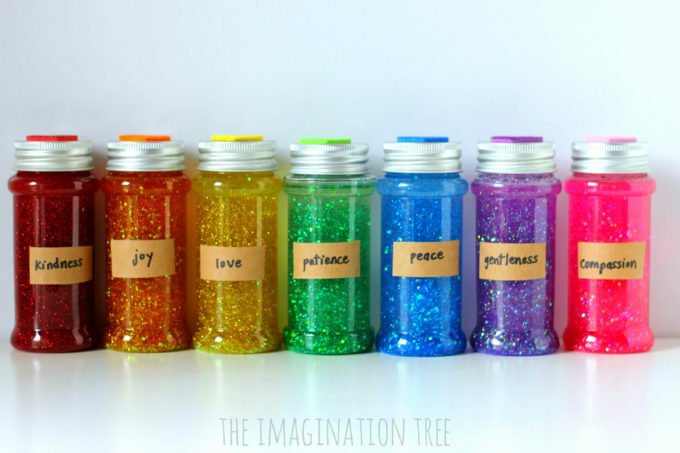 It’s a fun bit of science to discuss WHY does the glitter fall slowly and what other ingredients have helped that to happen? We also tried simply adding glitter to water to compare, which showed that although also very pretty to watch, it fell quickly and didn’t swirl around in the same way. Secondly, and more importantly, these have become an invaluable tool for discussion. We now keep them in a basket next to our copy of The Story of the Kindness Elves and they like to play with them while reading it. But we also pick them out and talk about the particular character virtue contained in each one, giving real life examples of how best we can show this towards others and try and develop it more. For example the other night before dinner time, in that fraught hour or so of the day when everyone is cranky and squabbling, Miss 6 came and helped herself to the green bottle of Patience and started to turn it slowly in her hands. She said “I am really needing this right now as “Miss 4″ is really annoying me! I am trying not to be cross with her.” I wasn’t quite expecting them to come and use the bottles in that way and I love how it has inspired some mindfulness and self-reflection in that way. Long may it continue because we need it! 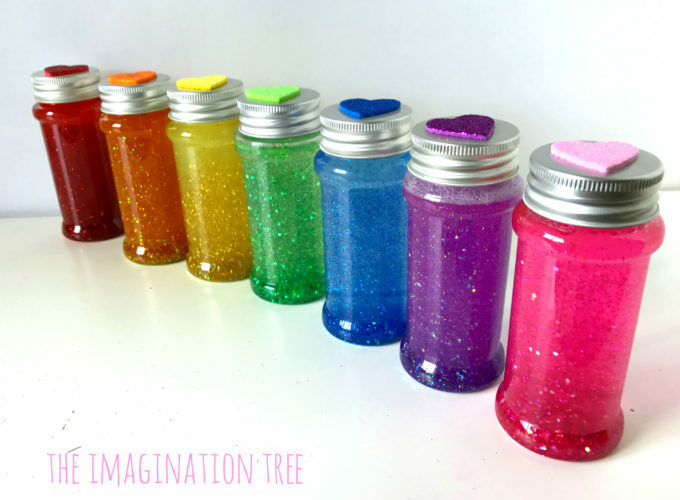 For toddlers and preschoolers the colours and sparkles are enough for discovery and amazement! They’re a great size for toddler hands to hold and shake and they look lovely when rolled along the floor too. You could use them to start a colour hunt and match other objects to each one! In a classroom this could be an invaluable tool for discussion and calm down time too, maybe including them in a basket alongside a sand timer and some books about feelings too. Passing each bottle around the circle and using it as away to talk about ways to demonstrate kindness and empathy towards others would be a great circle time prompt! 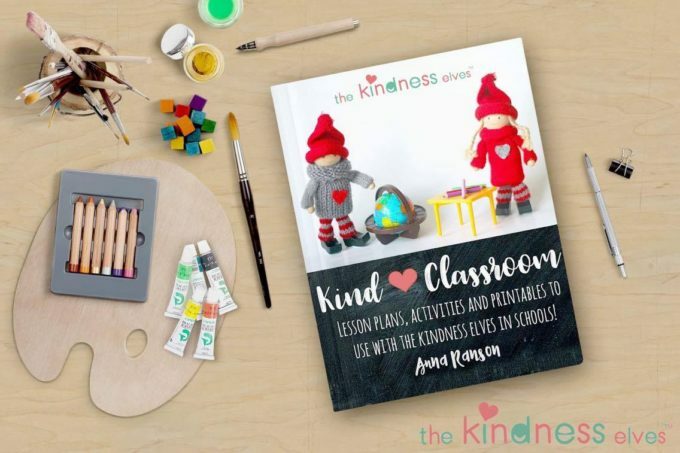 If you are a teacher who plans to use the Kindness Elves as a PHSE tool in your school then you may be interested to know that we’ve also got a Kind Classroom eBook and materials which you can find on our Kindness Elves website here too. 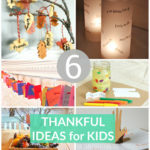 It contains lesson plans, loads of circle time and whole class game ideas and printables to use in the classroom. Many teachers are using it and loving it already! 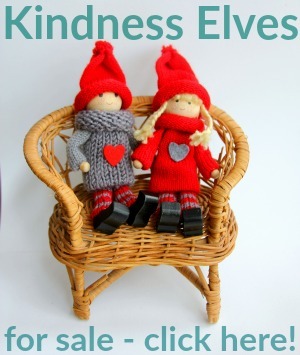 Have you read The Story of the Kindness Elves yet? 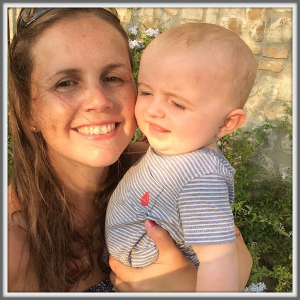 I’d love to hear what you think of it and to know if it has inspired any acts of kindness in your home or school! See a full archive of RAINBOW PLAY & LEARNING IDEAS here. And loads more posts about THE KINDNESS ELVES here! 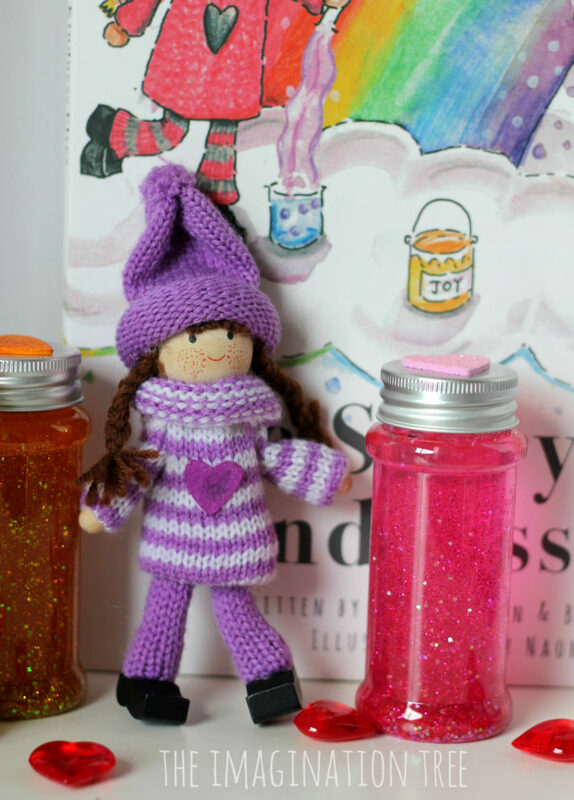 If you loved our Kindness Potions Sensory Bottles then please share them! Thank you. These look great. How do I avoid it from clumping? Hmm, mine didn’t clump together. Not sure? You’re not putting in any oil are you? That makes it clump. Just warm water, glitter glue and glitter. 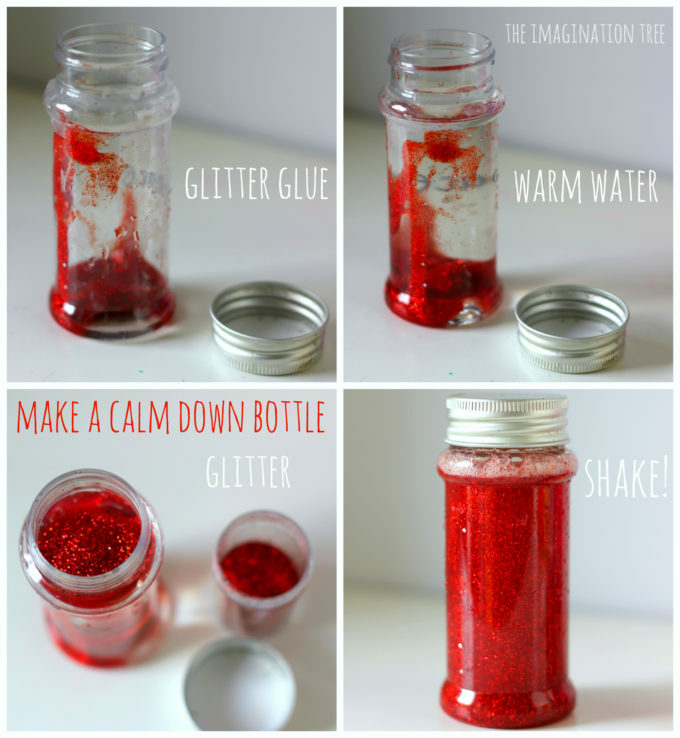 Make sure the water is warm enough to make the glitter glue mix well. Wonderful! I’m creating a new pinterest board just for posts like these called “magic” 🙂 This is the first (and only so far, haha!) post in that board! Thanks for the beautiful, simple idea.